I would like to see him on a line with a shoot-first RW and a pass-first LW. He would be able to increase his goals and apples that way. What I don't want to see is playing on a line of rookies and sophmores. Poirier and a decent passing vet on LW might be interesting. I don't mean GlenX either. If not Poirier, then I would like the Flames to go out and get a scoring, power RW'er. FA or trade; whoever fits the need and goals of the Flames. Perhaps Johnny Hockey and a vet RW'er would work too. Second half? He was stuck on 18 or 19 goals for like 16 games in a row and that's too long of a bad stretch for someone who you would consider showing flashes in the latter half of the season. In fact, most of his flash occurred early on in the season and then just like most rookies, he faded out and tired out as the season hit the 60-game mark and beyond. I would like to see him at 205 lbs because too much of his game is played along the boards. He needs the muscle to compete the way he wants to. If he doesn't get this done, then he won't last an 82 game schedule. Also, if Hartley wants to keep the Colborne - Monahan combination together, then Colborne's development is vital to Monahan's development as well. I hope to see Colborne muscle up to 225 so he can work the boards and the front of the net with more authority. Agreed here, it's no slight on Mony just think he gassed out in the latter half of the season for sure, I think this was the case at least and also the steady increase in different game situations probably had a lot to do with it too. I liked that line combination for the most part but like you said if Colbornes gonna play wing he should build some more strength, was a bit too lanky for my liking he's got the tenacity just not the strength yet being a tall guy. Apparently what Grat's said in one of his year end interviews he said once you get to know him he's more talkative and comedic, hope to see him progress in this area just for interests sake, i think as he develops his confidence more we'll see this. Yea agreed. It's no slight on Monahan. I don't think we will see 30-goals but like you, i see increased roles and responsibilities which is a positive step in the right direction. I don't think we see 70-point potential from Monahan until year 4. The only sophomore capable of 30-goals is Nathan Mackinnon. By year 4, hopefully Baertschi is playing a two-way game. Gaudreau enters his prime. Poirier and Klimchuk are productive players. The Flames will be looking pretty good in 4 years. Hopefully Colborne is still around too in a significant manner. I think that, as a 1st year professional he was only concentrating on improving and understanding the game as a true student. Once his game matures and he has played years I think he will get more vocal. That's what is so good about him, that he is easy to teach because he listens. He has been a deer in headlights, but good that he is watching and taking it all in. I can't wait until he improves his speed. I think in the first half of the season, we saw him getting to the dirty areas and having a nose for the net. The second half he started making plays with the puck and his play flowed a bit better. Good improvement for his first season. Just thinking of that gives me shivers heheh ooooo love seeing progression, hopefully there's lots of adversity, why do I feel so excited for a rebuild?!?! Probably because it's a long time coming. Here here, definitely has all the tools that's for sure, makes me think of a swiss-army knife of sorts, is that just me?? I'm excited to see his progression through the years, I may keep track of his interviews through the years to see his progression and how he reacts on the ice, see if there's a correlation just for S&G's . That goes for all our prospects, good times that's for sure. What I meant by flashes was he started using his size more as he got more comfortable with the game. I agree he went on a long stretch of no points but I seen him go to the hard to play areas like in front of the net more during the second half then I did the first. That is all I meant. I don't want to see Monohan given anymore responsibility then he already was last season, let the kid come in and play his game, see if he can take a few more good steps forward and just let him still be the kid on the team. We all know his work ethic and maturity are far above average for his age group, but he is still only 19 and he should be treated as such. He will natural start taking on a leadership role when hes ready. How long did our previous captain play before he was handed over the C? If he slumps next season, then let him figure it out, if he excels, then pat him on the back and put him right back out on the ice. Just dont over whelm him with preexisting expectations that will weigh him down through a 82 game season. Champion of the Big Hit. I agree. In fact I am really happy to leave Bean with the C until he is no longer a flame either through retirement or trade. Honestly I think he was a fantastic Captain last year. I see Monahan as a Yzerman type player leading by example and hard work first. His talent will grow with every year of experience he gains. Positionally on the ice he is a very smart player which makes up for not being the fastest skater. I wouldn't get to hung up at this point on whether Colburne stays on his line or not. Colburne was equally as impressive with the progress in his play as Monahan. Should Colburne add a few pounds prior to next season and continue to progress he will be an asset. Video update on Sean Monahan's rookie season. I like the kid and hope he stays with the team but I just hope as he grows he starts to play a little more of a gritty game right now after watching him in the Canadian jersey I thought he was more of a floater type of player. I hope it is just his youth and how the coach wanted him to play that is my only concern. I'm sure he'll begin understanding how to use his body effectively, remember it's his first year and I doubt he's used to a full 82 game schedule it'll come and that's what's so exciting given what he managed this year! not only that, he's 19, never played against grown men and plays on one of the smallest teams in the league. IMO if he can continue to develop his defensive game with out giving up the offense, it will more then make up for his lack of physical play. Monahan will likely never be a physical player. He wasn't in junior. It is one of the reasons I am not a huge Reinhart fan. Even if one of those guys develops into a first liner it leaves us pretty gentle up the middle. Especially if Backlund sticks around on the third line. I agree Monahan, Reinhart, and Backlund has a lot of potential. I won't be complaining if we get Reinhart. But most of the great teams have some size and grit up the middle. Especially in our division. Having variety down the middle and compliment each on the wings. I think you're better having dissimilar style guys as a 1-2 punch for success, bigger skill guys on Monahan's wings and if you get the grittier style center with shifty guys on his wing you're golden. Proper team balance is key, I think that's what both us and the guys up North are lacking, not sure how well they are moving in their future direction but I think we are on the right track! Monahan isn't gritty, but he knows how to use his size to protect the puck, and isn't afraid to go into the corners either. Another Kopitar comparison. If having two steady Kopitar-esque players down the middle on your team isn't a recipe for success, then we need to define what is, because I'm a little confused. Personally I look at a kid like Bennett and wince because he's wreckless with his frame. 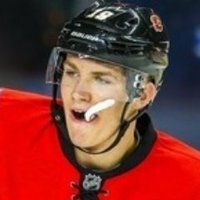 A kid like Reinart playing the same style as Monahan utilizes their strengths in other ways than sacrificing the body, and are still able to play within the hard knocks of the game. Wingers and larger D can shore up the grit factor here. Look at the ducks team Burke won the cup with. Centres were Andy macdonald, Ryan Getzlaf and Sami Paulson and I would describe none off those as physical players. I would say Chicago has a physical centre in their top 9 either. A lack of physicality is IMO easily built with wingers and defence and I'd prefer smart centres who can dictate the play then a physical one. Centres shouldn't be throwing a lot of hits IMO because that probably means they are in a chase position. Who's been more valuable over there career, Danny Briere or Paul Gustaud? Joe Sakic or anybody else? I agree fully based on known quantities of other teams, but also (Cgy point of view) IF Gaudreau is to stick in a top 6 role I think you may have to compensate with a more gritty styled center (I guess a guy like Joe Thorton on your RW would be fine too). This is just my speculation and loose diagnosis but I think with Johnny he's going to be the type of guy to dictate the play just because he can see the ice so well and will do the opposite of what you would expect, and his amazing pin-point accuracy *shudder*. I don't know well how that type player gel's with a guy of equal capability like Monahan (Probably amazing hahah) but just thought it's a point to make and how I envision things. Yes, agreed, brawn isn't the be all end all, good centers aren't necessarily physical or "brawny" as you put it but I'd love a guy who has stability. Able to hold the puck, make time and space for himself, and not be knocked around alot.... but I guess you could equate that to IQ because they know how to manipulate balance and weight to prevent themselves being knocked around like a pinball. Right or am I just out to lunch? ?